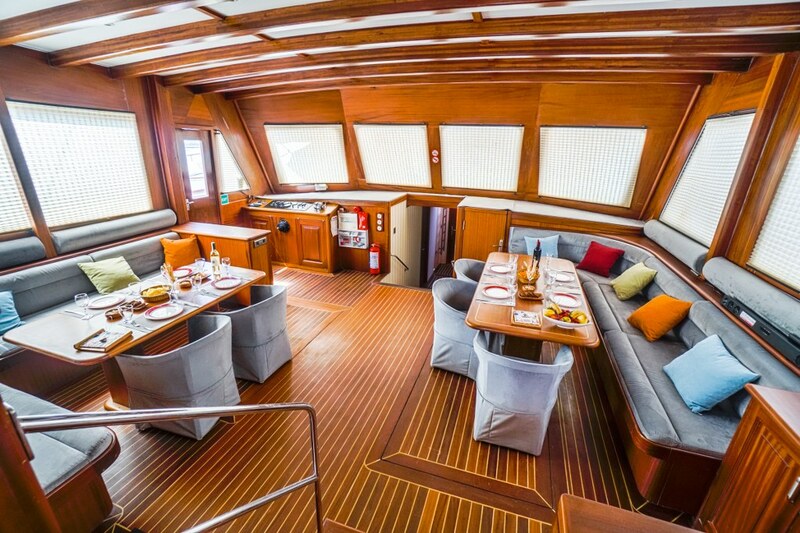 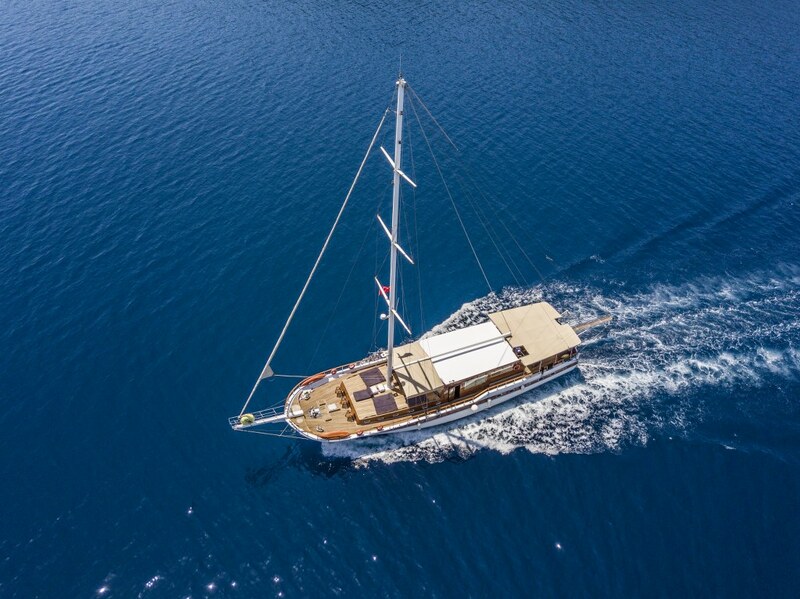 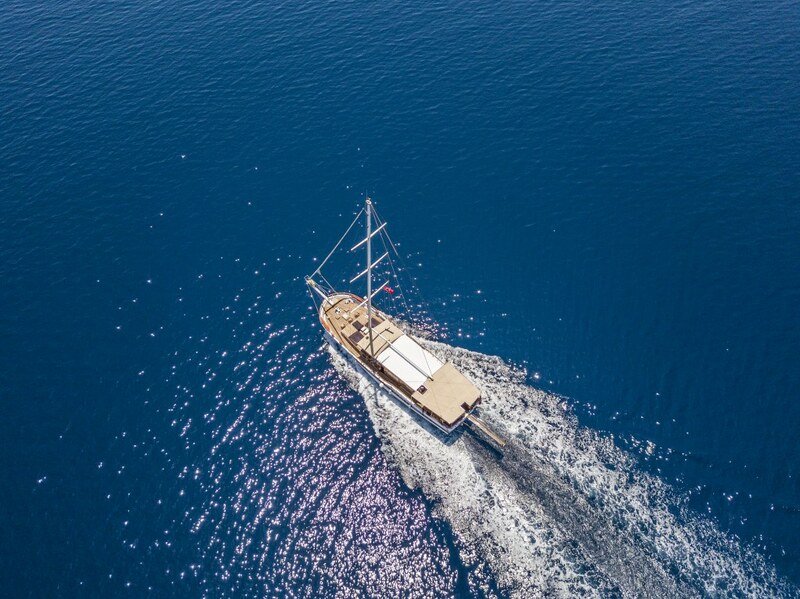 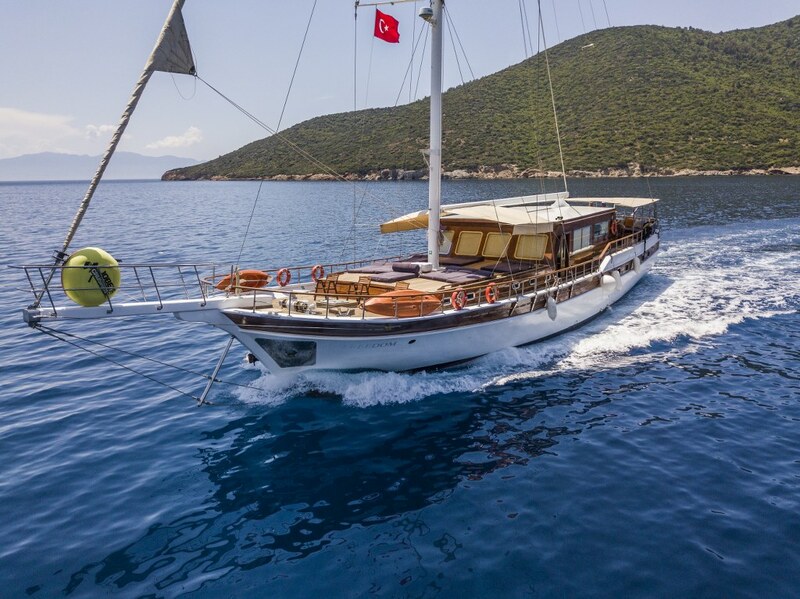 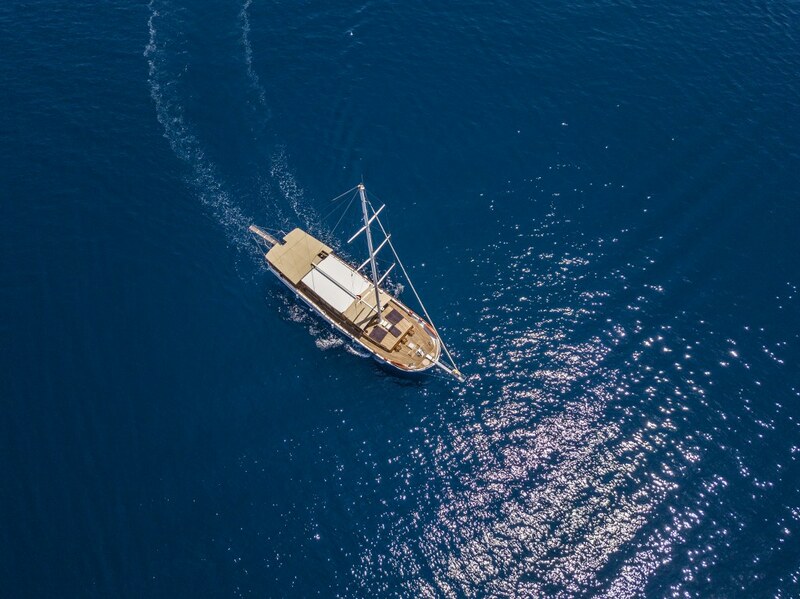 The luxury gulet ketch Freedom, one of the more recently built and larger gulets based in the Bodrum harbour, displays a very modern, cool, uncluttered style of decoration and practical layout that will please guests looking for a crewed gulet cruise with a luxurious amount of space. 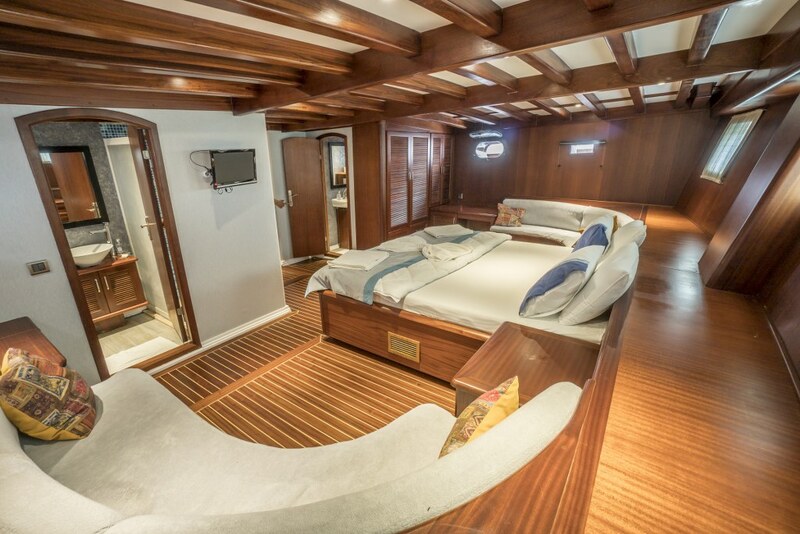 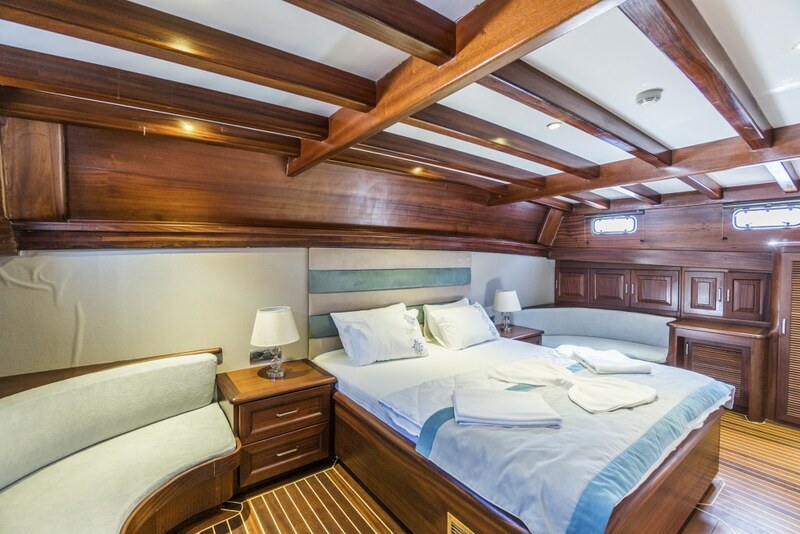 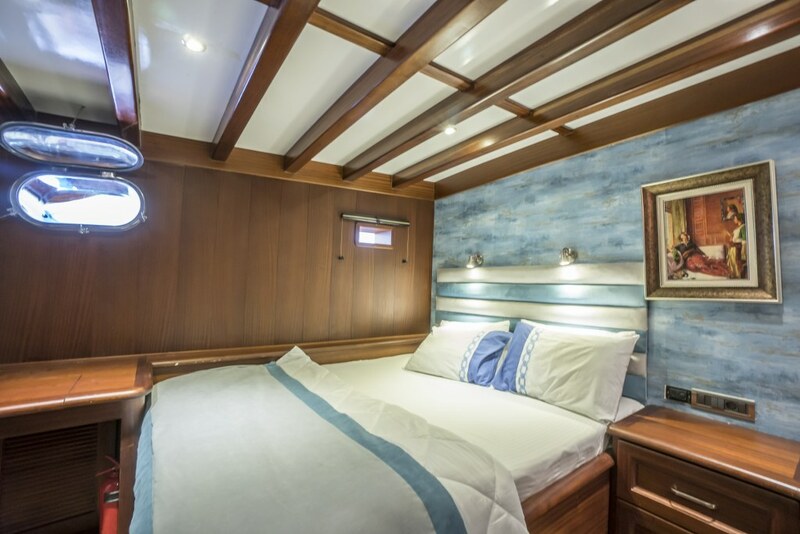 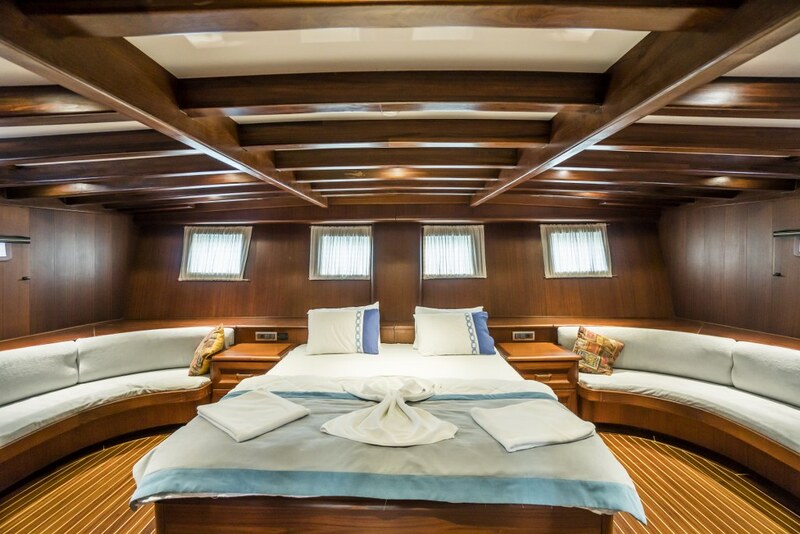 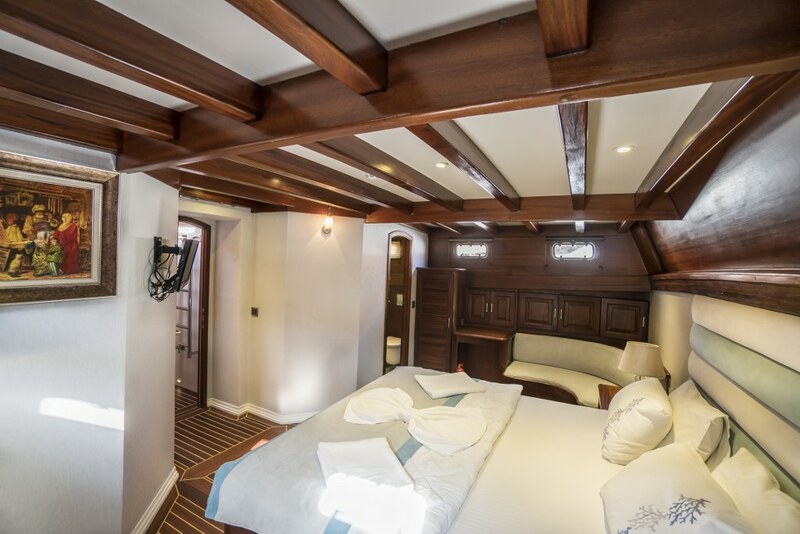 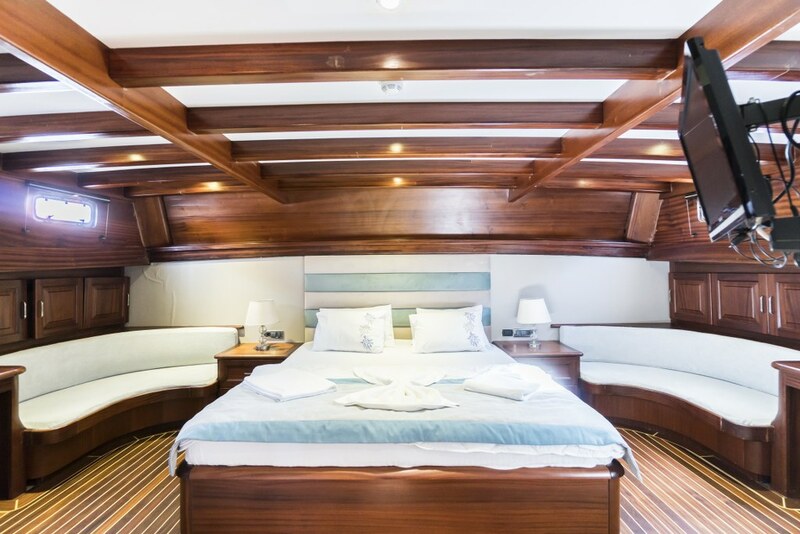 The two full beam width master cabins are spacious with a central queen-sized bed set between two curved banquette couches, and include wardrobe and storage space, and a tiled shower bathroom. 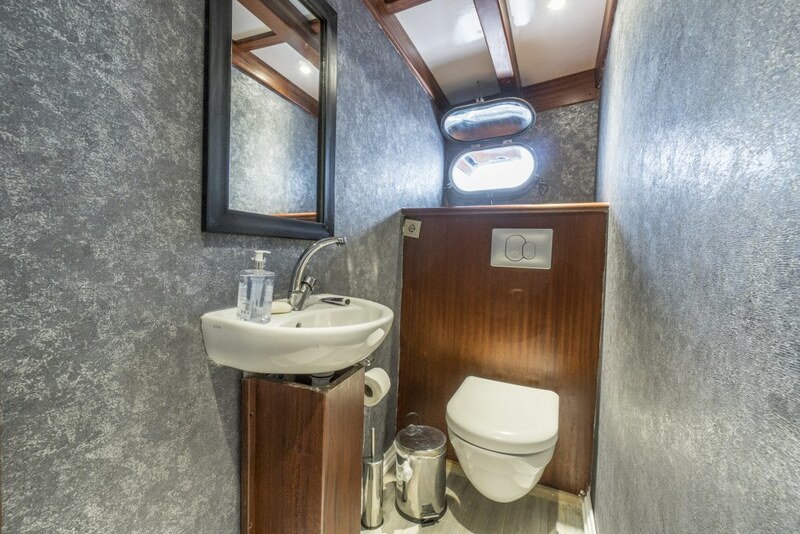 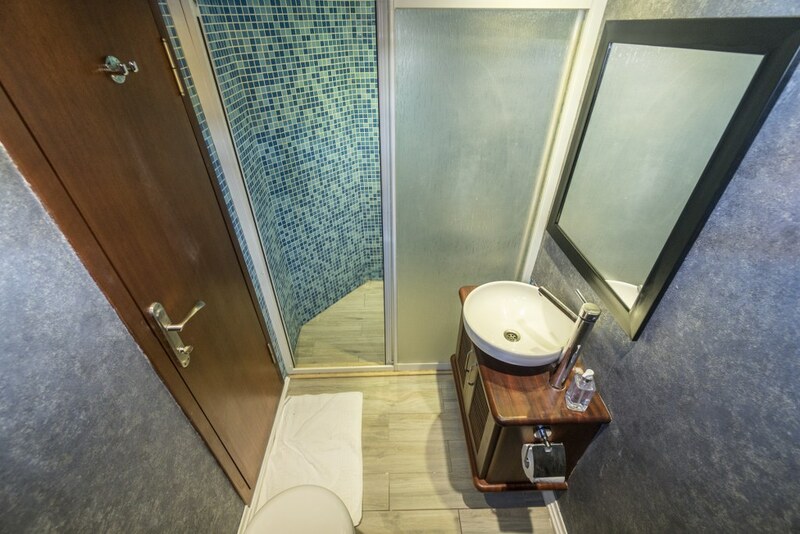 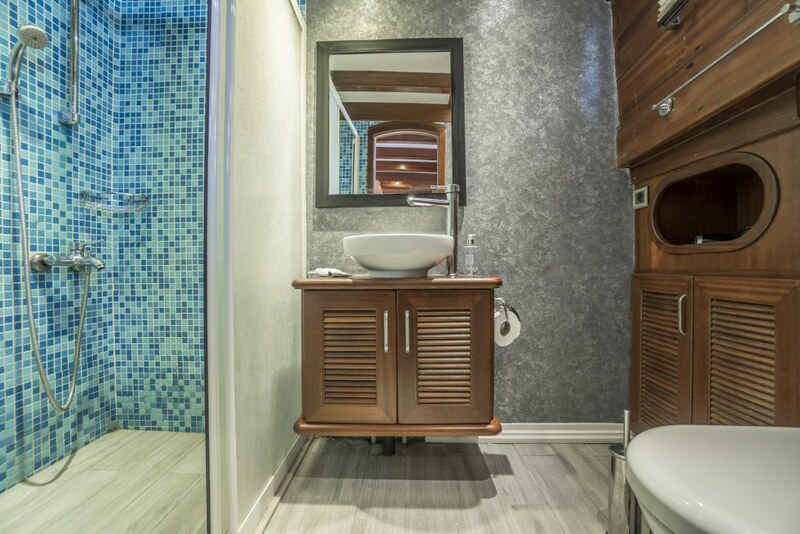 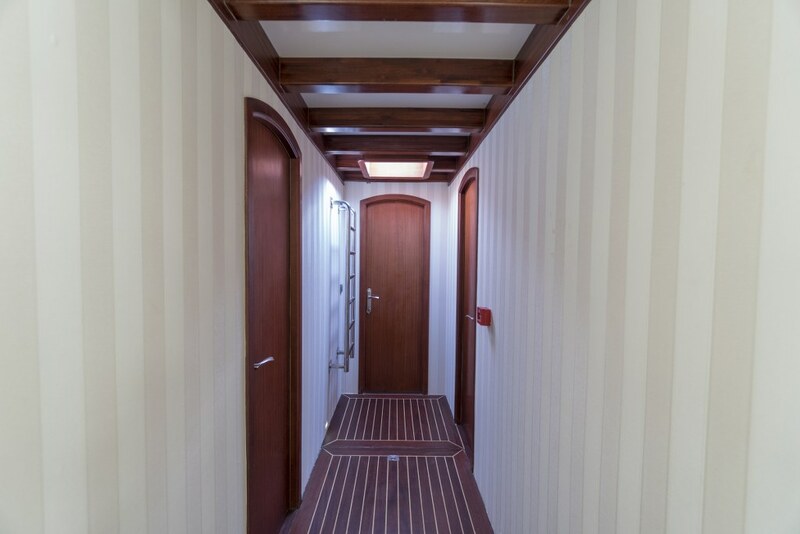 The four double bed cabins, one of which has an added single bed offering a flexible accommodation arrangement, also have their own shower bathrooms and storage. 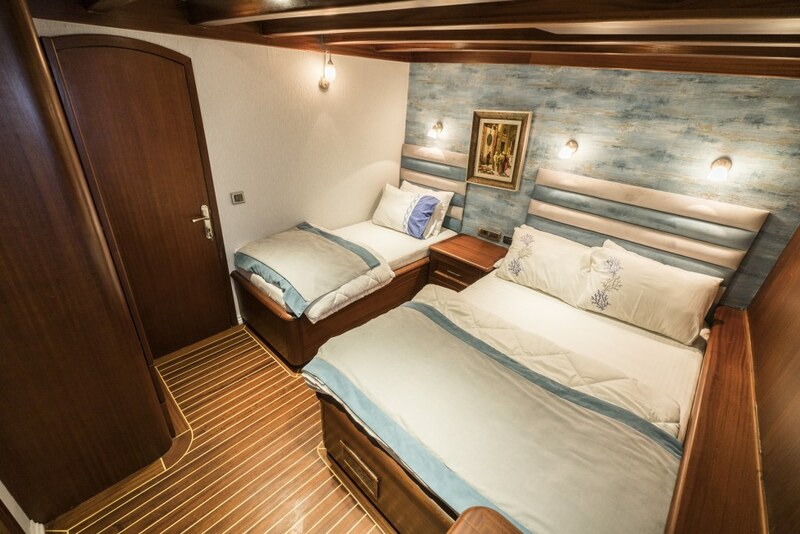 All cabins have a TV installed, and air-conditioning is available throughout. 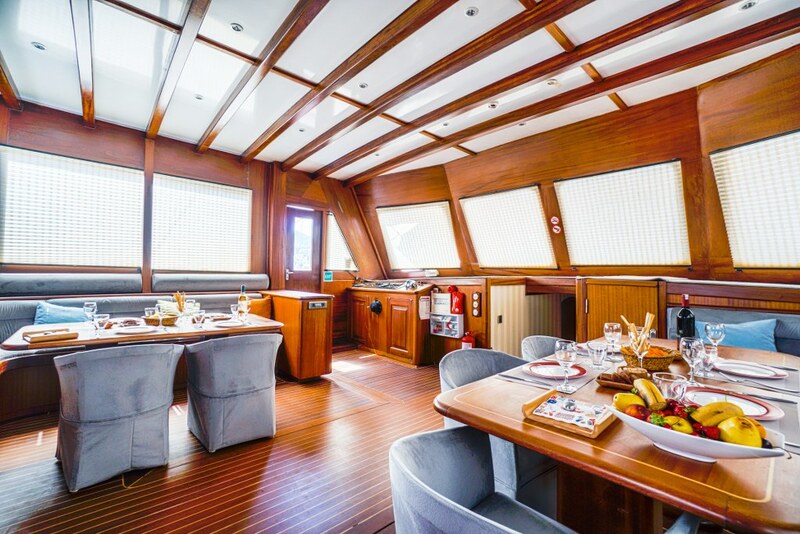 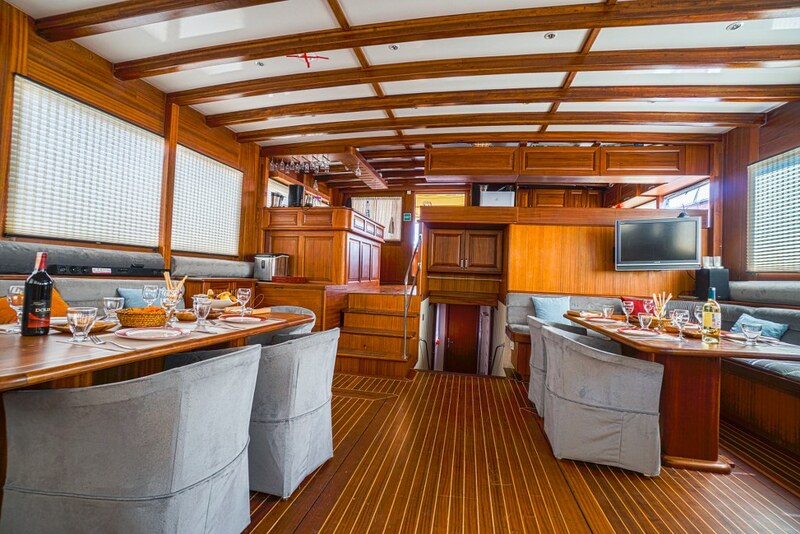 The indoor saloon of luxury Turkish yacht Freedom is an entertainment area in its own right, with the same modern chic style used to good effect giving space for two corner sofas with two tables, and with air-conditioning , TV/DVD, music and internet available. 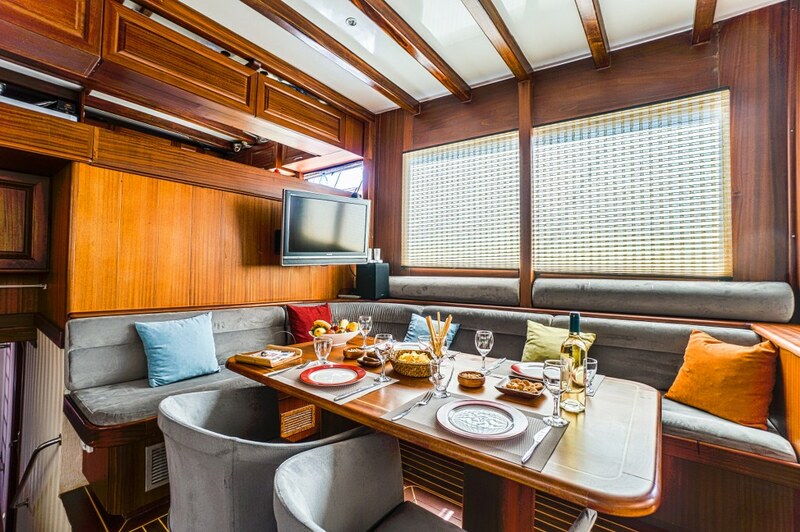 The space on deck is the ultimate relaxation area, with one full outdoor dining table set against its own bench seat on the aft deck beneath the fixed awning with another cushioned lazing zone across the stern. 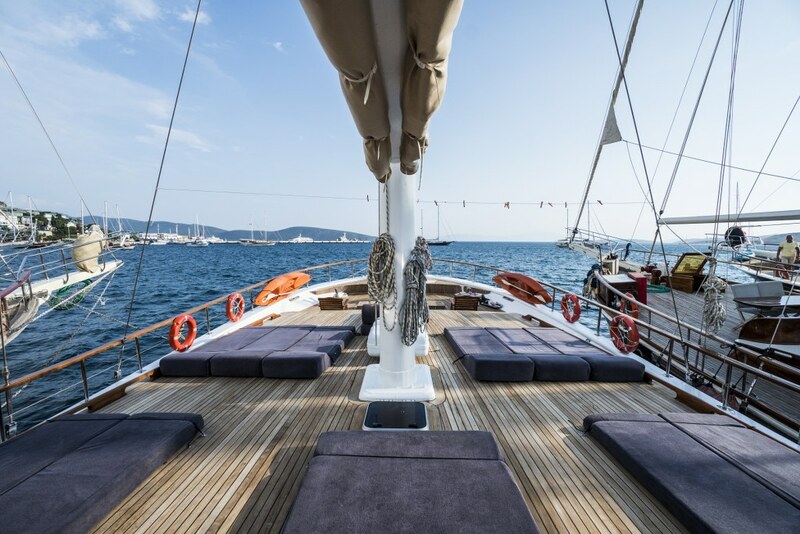 Up forward around the single mast on the deck are many sunbeds for guests to laze on under awning or sunshine as required. 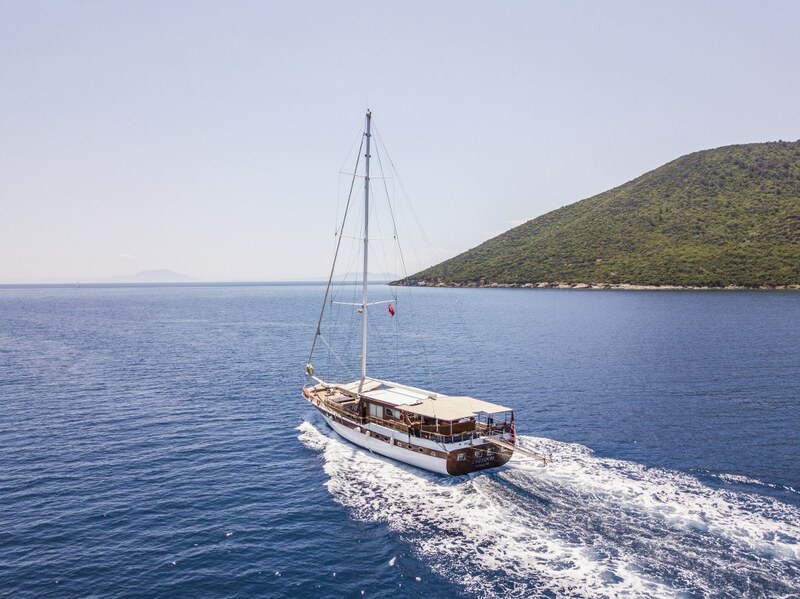 For the active the water beckons and canoe, ringo and water ski are the water toys available for a lot of playtime in lovely sheltered bays and anchorages. 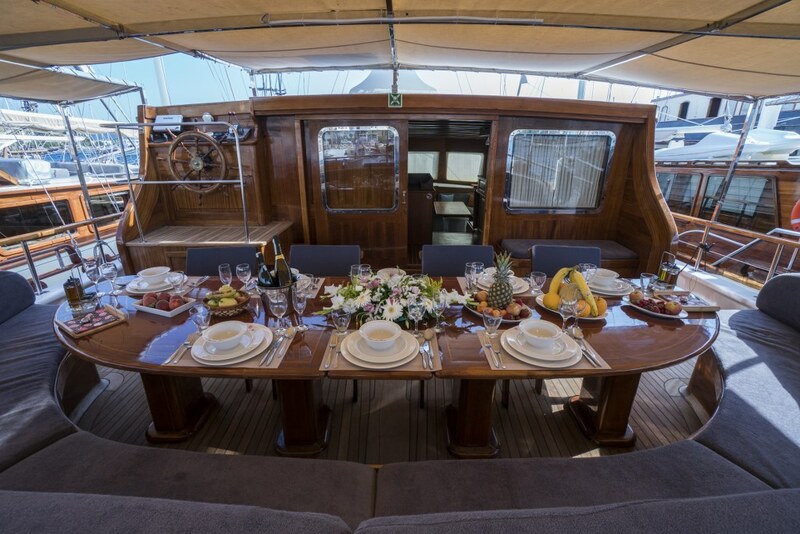 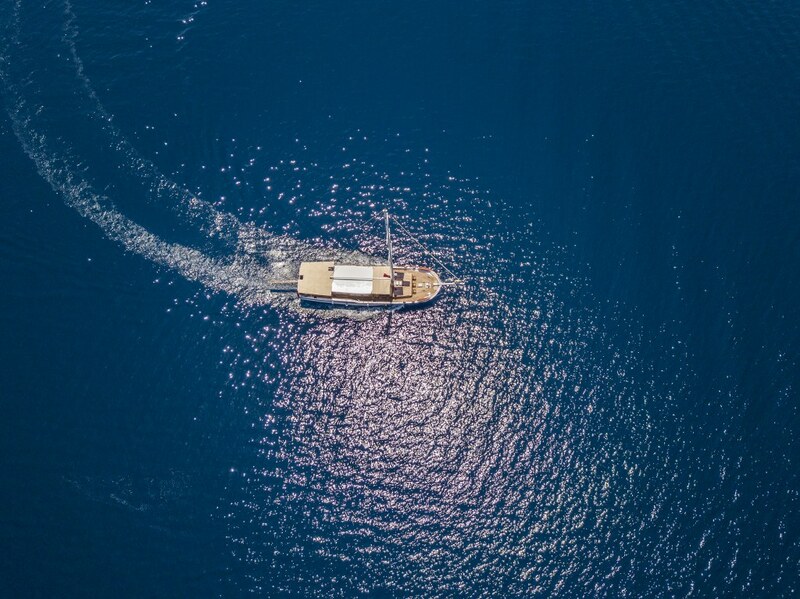 The captain and three crew on Freedom yacht, who have their own quarters, are on hand to present all the meals, drinks, service, handle the cleaning and ship care, and help with all the activities in the most friendly professional way. 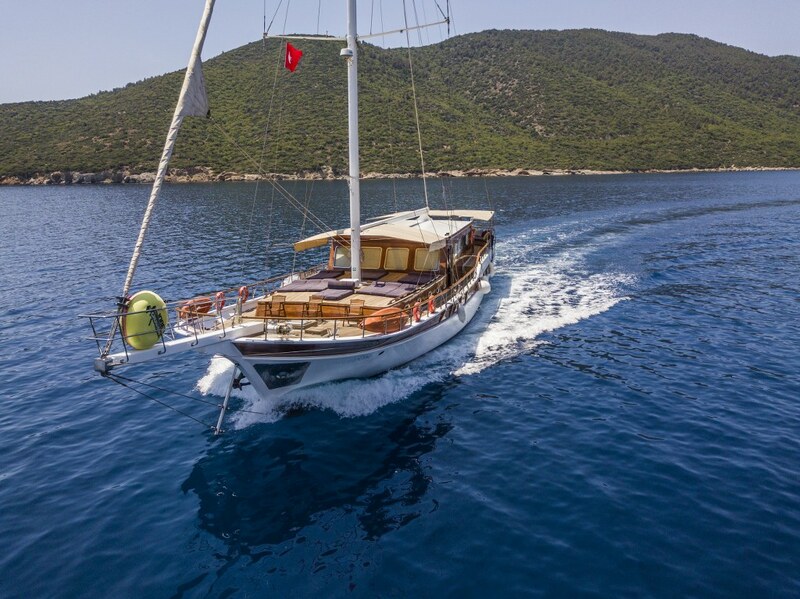 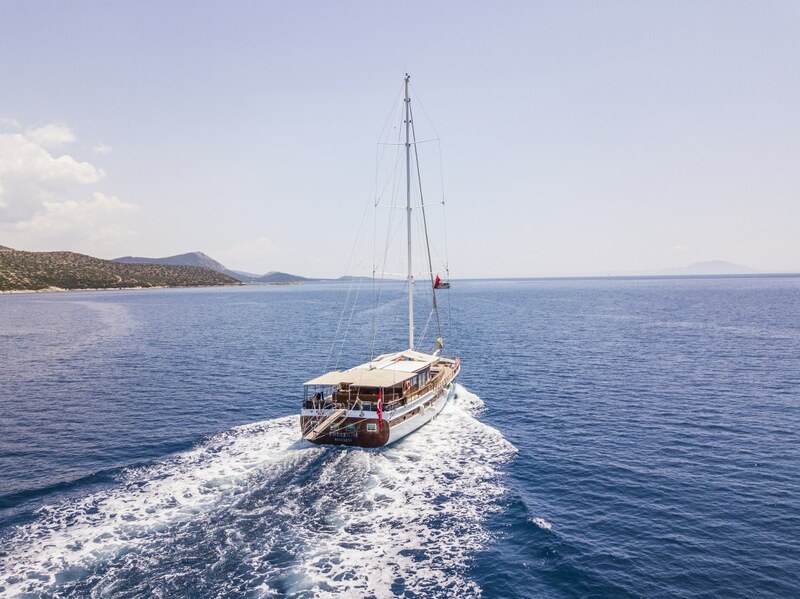 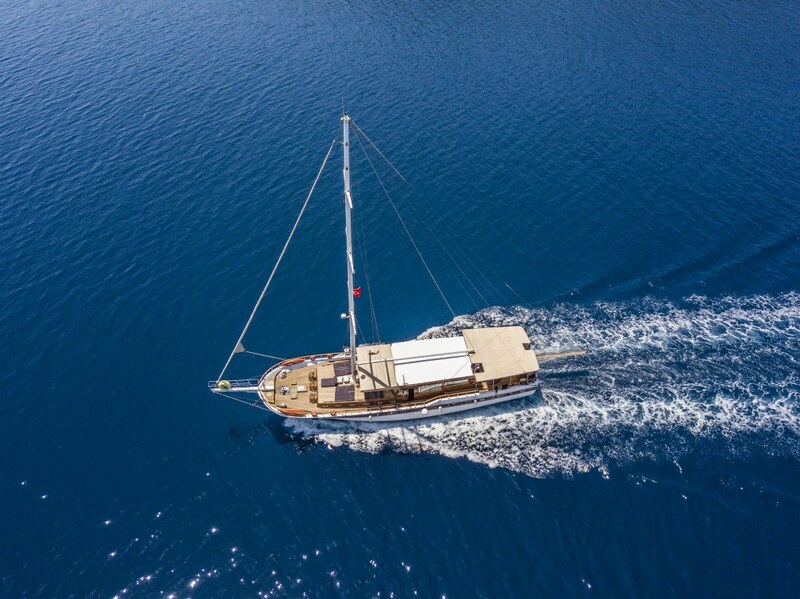 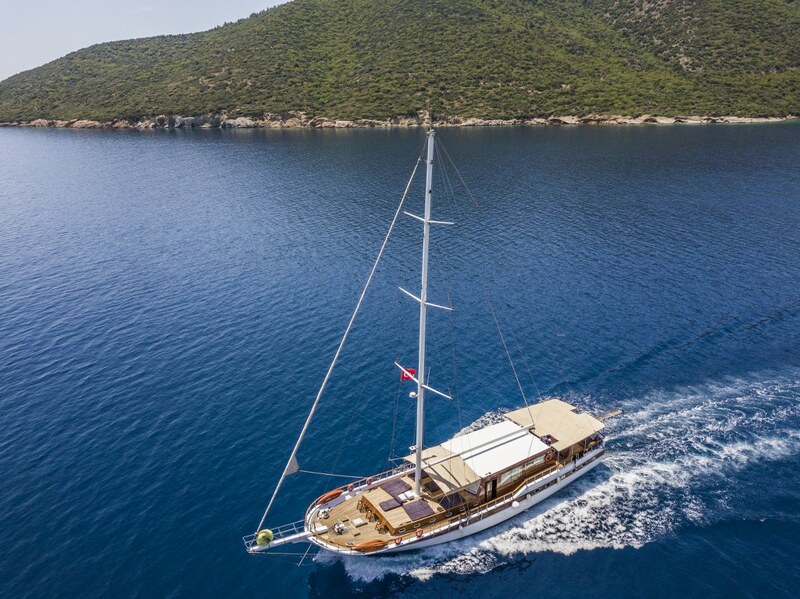 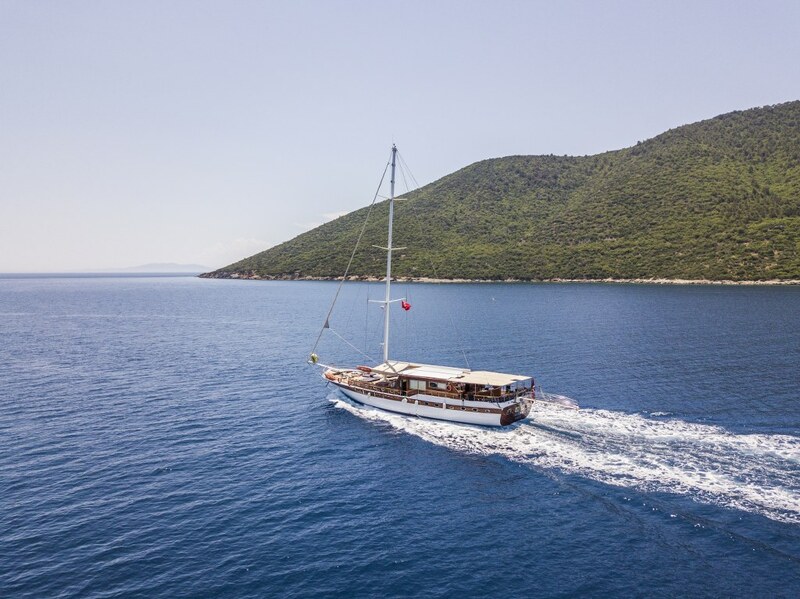 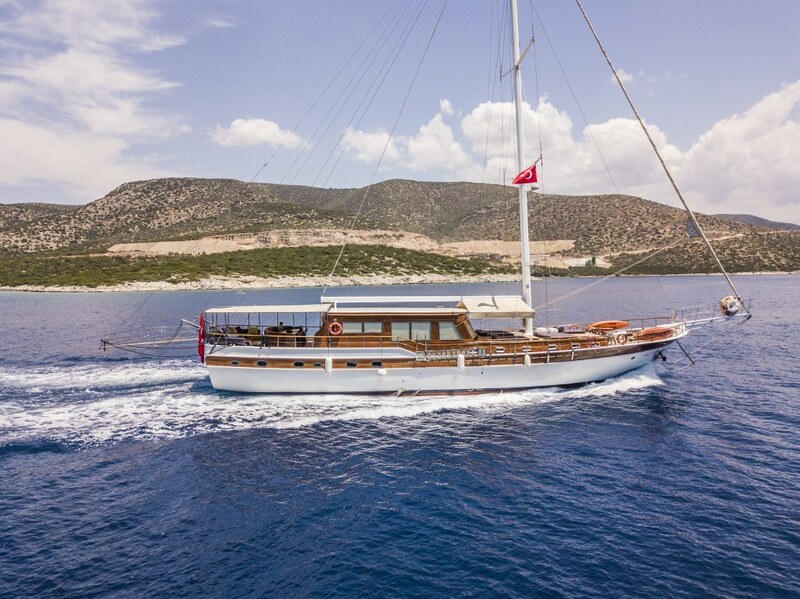 They will guide the motoring gulet La Finale to find the best bays on the beautiful Aegean and Mediterrranean coasts between Antalya, Bodrum, Marmaris, Gocek and Fethiye, creating the most relaxed, enjoyable holiday cruise possible.